The adivasis dig holes and fill them with smoke. The gathered smoke suffocates the rats due killing them or rendering them unconscious. 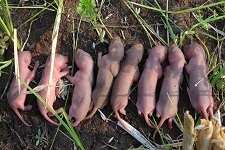 The baby rats that survive are given to children to play with and slightly grown rats are tied by their tails and made to run around like remote control cars, which seems to be the case when observed from a distance. The biggest in size are used for their consumption - making a curry out of it or just roasting it for a quick snack. The village of Barda amuses you as you walk through it since it looks like the village each one of us drew in school. You would typically witness women and men equally spending their time in the farms and engage themselves in various household chores. Some of these adivasis have also adopted the technique of organic farming and believe that natural insects and worms are any day better than chemical fertilizers.